Aruba is a tiny Dutch Caribbean island off the coast of Venezuela with beautiful blonde beaches, gentle surf, and warm, sunny weather. In addition to these obvious draws, the island features an array of all-inclusive resorts, glorious European-influenced architecture with Dutch gables in pretty pastel colors, and a vibrant, compact capital called Oranjestad. 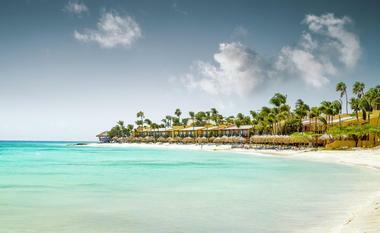 Here are the best things to do in Aruba. The Arikok National Park is a vast national park on the island that takes up nearly 18 percent of the landscape and features three primary geological formations, namely limestone, quartz diorite, and lava. In addition to being spectacular natural wonders, these formations have directly influenced Aruba's human settlement. The Arikok National Park is home to the island's oldest Arawak paintings as well as several species of wildlife that are endemic to the island, including two unique bird and snake species, namely Baker's cat-eyed snakes and the Aruban burrowing owl. Visitors to the park can explore traditional Aruban houses and enjoy a variety of hiking trails that wind past plantation ruins and gold mines. The world-renowned Palm Beach Aruba is a magnificent 2-mile-long strip along the coast of the island that is home to luxury hotels, glamorous restaurants, stylish beach bars and cafés, and high-end boutiques and shops. Dotted with piers and watersports concessions, this famous stretch of beach is also a haven for swimmers and snorkelers due to the calm waters and offers idyllic sunrise or sunset walks along the sand. Palm Beach comes alive at night with an array of buzzing bars, nightclubs, and casinos as well as cinema theaters, bowling, and spa facilities in two of the largest shopping malls on the island. 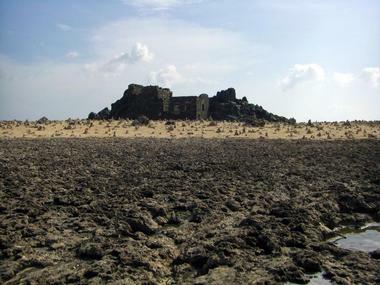 Located between Wairiruri beach and Andicuri beaches on Aruba, the Bushiribana Gold Mill Ruins are the remaining remnants of a long-abandoned gold mill that processed gold ore during the Aruban gold rush in the 19th century. Gold was discovered in Aruba in 1824, and the Bushiribana smelter was built by the Aruba Island Gold Mining Company a year later to extract gold from the nearby hills of Ceru Plat. The mine operated for 10 years and the industry produced more than three million pounds of gold over the decade. 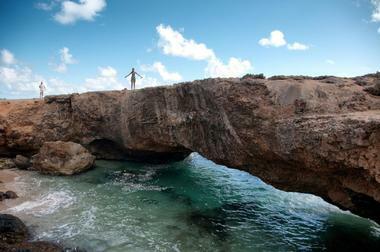 Today, the Bushiribana Gold Mill Ruins are a favorite stopover for tourists en route to the Aruba Natural Bridge. 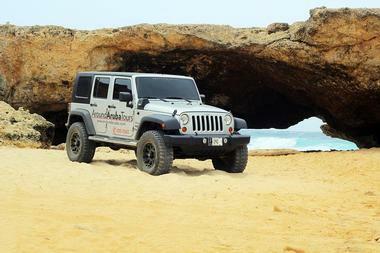 Around Aruba Tours offer fun-filled, exciting jeep tours around the island. The tailor-made Jeep Safari Tours explore Aruba in luxurious, fully air-conditioned Jeep Wranglers and visit both the island's most popular attractions and its hidden gems, including the Bushiribana Gold Ruins, the Natural Bridge, the Ayo Rock Formation, Casibari, the Natural Pool, and other such famous landmarks. Tours include pick-up and drop-off options, snorkel equipment and towels, non-alcoholic drinks, and free entrance to Arikok National Park. Jeep Wranglers can also be hired for private use for self-driving adventures. 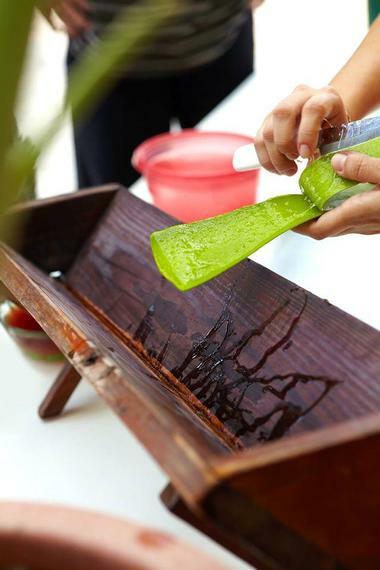 Located in Hato, the Aruba Aloe Museum, Factory and Store offers complimentary museum and factory tours of the establishment that explore the domestication of the aloe plant and the processes behind the making of aloe-based skin care. 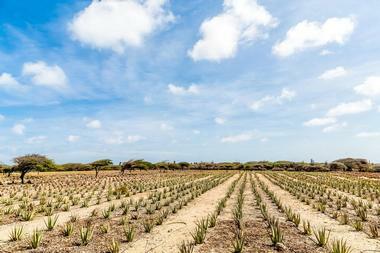 Led by local Aruba Aloe tour guides, these informative and interactive tours are held in a variety of languages and occur daily every 15 minutes. Visitors can also explore the museum on self-guided tours, beginning with a short audiovisual presentation on the history of the museum, which include a walking tour of the factory facilities, including the aloe cutting room, the testing lab, and the filling room. 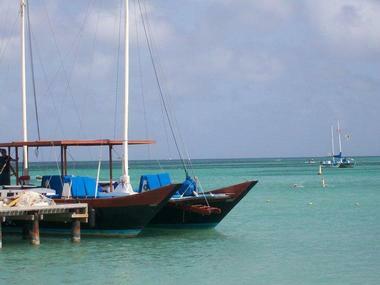 Aruba Bob Snorkeling offers memorable snorkeling experiences in the crystal-clear waters around Aruba. Owned and managed by Kent, also known as Aruba Bob, Kyra, and Alex, snorkeling tours enter from the beach and make use of underwater scooters to cover nearly one mile of spectacular reef teeming with marine life, fish, and colorful coral. Aruba Bob Snorkeling tours focus on safety first, so snorkelers wear inflatable or wholly padded lifejackets and all equipment is provided, including fins, masks, snorkels, and water shoes. 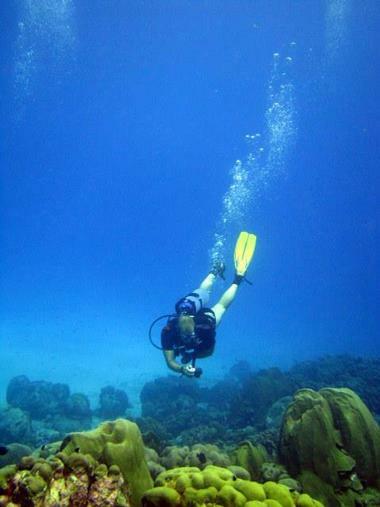 Tours generally last for around 1.5 hours, depending on the conditions of the sea and experience of the snorkelers. 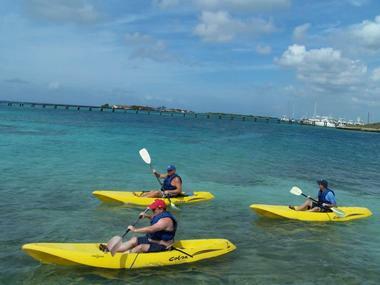 Aruba Kayak Adventure offers visitors a chance to experience the Caribbean at its best on daily kayaking and snorkeling tours. Combining the fun of water sports with the thrill of exploration, kayaking tours explore the mysterious hidden caves and beautiful mangrove forests of the coastline, while snorkeling trips go beneath the surface to discover the wonders of the ocean. Tours are led by professional and knowledgeable local guides who share their extensive knowledge of Aruban folklore, history, and nature and include safety and instruction briefing beforehand. Tours include exploring the legendary Spanish Lagoon, calm inland waters, and coastal mangroves as well as guided snorkeling excursions of Aruba's South Coast Barrier Reef. Each tour includes transportation to and from hotels, all kayak gear, a guided snorkel tour with snorkel equipment, and lunch. 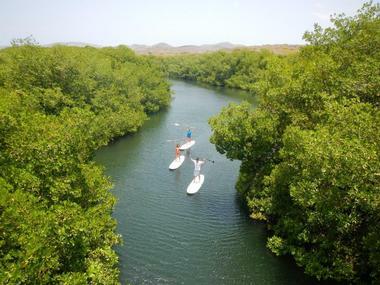 Aruba Surf & Paddle School offers stand-up paddleboarding (SUP) and surfing lessons to all ages and levels of experience as well as rentals of paddleboarding equipment from leading brands, private paddleboarding parties, and SUP YOGA. With over 20 years of experience, the school provides certified and friendly instructors who lead lessons in a fun and interactive environment and aim to provide nothing less than outstanding service. Surfing tours take visitors to some of the island's best surf spots and include transportation to and from hotel or villa, equipment, refreshments, and a mini tour of the isle. 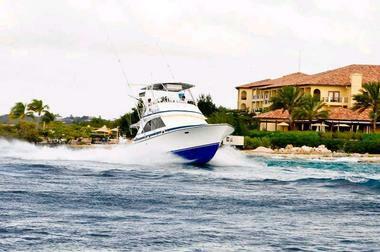 Blue Melody & Black Pearl Sailing offer unforgettable tailor-made sailing trips and cruises around the island. Sailing trips are taken on the Blue Melody or Black Pearl cruisers, which feature plenty of comfortable seating with shade and full amenities. Sailing tours include cocktails and other beverages, delicious food and snacks, opportunities to snorkel in crowd-free places, sunset sailing, and a complimentary video of the trip. The cruisers can be rented for private sailing trips and special events, such as weddings, anniversaries and other celebrations, and the company also offers snorkel equipment rentals. "Made in Aruba" Sightseeing Tour is a small family-operated tour and transportation company that offers flexible and personalized tours of Aruba. Tours are led by professional Aruban tour guides who share their passion for and knowledge of the island and show guests all the best attractions and the hidden gems the island has to offer. 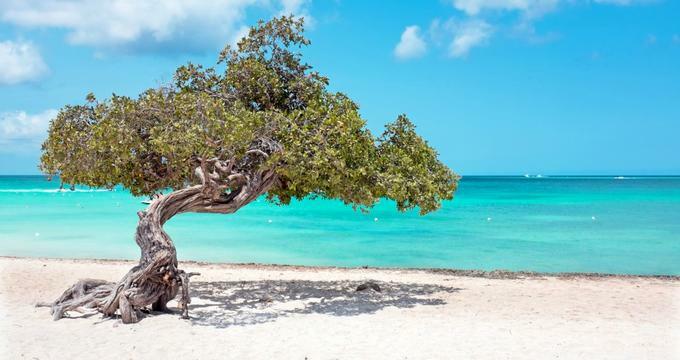 Tours include "Highlights of Aruba," which offers a unique view of the island's most photographed attraction – the Natural Bridge – and "Taste of Aruba," which explores the local products made on the island, such as Balashi Beer and Aruhiba Cigars. Special shoreline tours are offered for cruise-ship guests, who can explore the island on a short-enough excursion to get back to the boat in time. 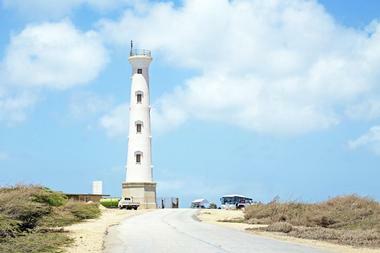 Located on the northwestern tip of Aruba near Arashi Beach, the California Lighthouse was built in 1910 to warn ships from the coastline of the island. Named after the S.S. California, which was wrecked nearby in 1891, the lighthouse is now a landmark for tourism, beckoning visitors to experience the most spectacular views of the island's western coastline, which include rocky coral shorelines, white sandy beaches, and the beautifully landscaped golf course of Tierra del Sol. Next to the lighthouse are the California Sand Dunes, which offer loads of family fun, while refreshments, lunch, or dinner are available at the La Trattoria el Faro Blanco (The White Lighthouse) restaurant. Take an exciting and unforgettable voyage into the depths of the Caribbean Sea on an Atlantis Submarines Expedition. Voted Aruba's most outstanding attraction, visitors are taken 130 feet below the surface of the sea on a guided tour in the largest passenger submarine in the world. U.S. Coast Guard-approved, environmentally friendly, and fully air-conditioned, the submarine tour lasts approximately one hour and 45 minutes and explores the colorful marine life that lives in the waters around Aruba. 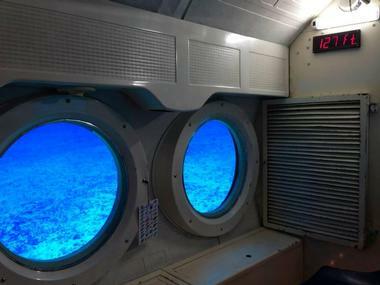 Tours depart from the Atlantis Submarines Store downtown across from the Renaissance Resort and guests are advised to wear casual clothing and comfortable walking shoes. Children must be a minimum of 36" in height (90 cm) and 4 years old to ride the submarine. Founded in 1997, Donkey Sanctuary Aruba is a non-profit, volunteer-run organization with a mission to save the donkeys on Aruba. 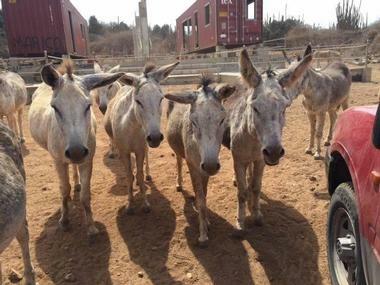 Used as the primary form of transport on the island until the 1970s, the donkeys were severely mistreated and overworked; however, now the sanctuary provides a safe haven for over 130 rescued and abandoned donkeys, where they are cared for and nurtured back to health. Visitors to the Donkey Sanctuary can help with the daily chores of feeding and caring for the donkeys or simply watch these adorable animals at play over a coffee or a cold beverage and snack on the covered porch. Driftwood Fishing Charters offers full and half-day deep-sea fishing charter trips on a 35-foot twin-engine tournament rigged yacht called Driftwood. Owned by Herby, who also owns the Driftwood Restaurant, which is renowned for fresh seafood and fish, Driftwood Fishing Charters has been in operation for more than 25 years and fishes for a variety of catch, including kingfish, wahoo, tuna, barracuda, sailfish, and marlin. Charter trips include an experienced captain and crew, all fishing equipment, bait, sodas, and bottled water and depart from the Renaissance Marina in downtown Oranjestad. Eagle Beach is one of the island's most spectacular beaches, with pristine and soft white sands that slope into the azure waters of the Caribbean. 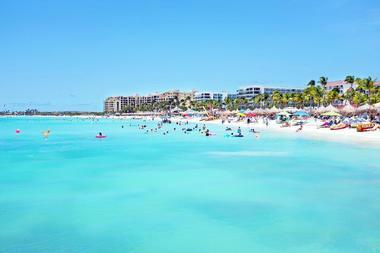 This is the widest beach in Aruba and boasts safe swimming areas, ample parking, shaded picnic areas, thatched huts, and a variety of motorized water sports. Eagle Beach is also famous as a turtle nesting area for four species of turtle and every year the beach is dotted with red and white markers to protect turtle nests, whose hatchlings emerge around sunset and at night. Tourists flock to the beach during the season to watch this amazing natural phenomenon. Eagle Beach is also home to two world-renowned fofoti trees, whose trademark silhouettes point in the direction of the Caribbean. 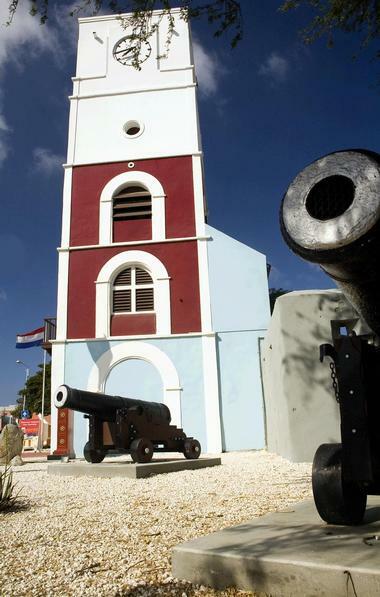 Fort Zoutman is a military fortification at Oranjestad in Aruba and the oldest building on the island. Fort Zoutman was built in 1798 by the Dutch army and armed with four cannons to protect the town against enemies and pirates. The Willem III Tower was built in 1868 and served as both a public clock tower and lighthouse, which was first lit on King Willem III's birthday. The fort and tower were restored and re-opened to the public in 1983 as the Historical Museum of Aruba and is now a proud symbol of Aruba's national heritage. Every Tuesday evening the Bon Bini Festival is presented in the outer courtyard of the Historical Museum, which showcases the island's history through local music and art, traditionally costumed folkloric dancers, and delicious culinary specialties. 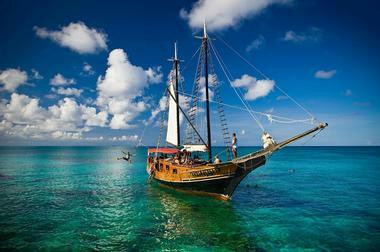 Jolly Pirates Cruises offers a variety of sailing cruises and charters on boats designed to imitate pirate ships. Tours include swimming, snorkeling, rope-swinging, and sunset cruises, and boats can be hired for private charters and tours for special occasions. 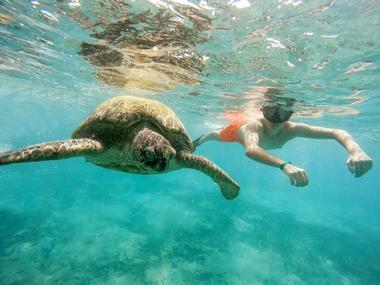 Snorkeling tours visit some of the island's most popular snorkeling sites, such as the shallow reefs at Boca Catalina and Malmok and a WWII German shipwreck. The boats have full-service bars on board as well as a selection of snacks and other refreshments and full amenities, and are crewed by experienced and professional staff and seamen. The Kukoo Kunuku is a fun-filled party bus with music, maracas, and a full-service bar that cruises the city streets and country roads in search of a great Caribbean party. 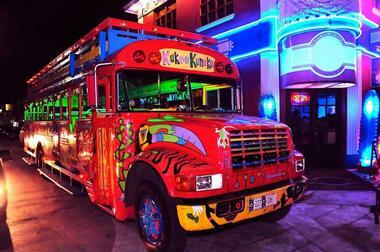 The "party on wheels" bus visits a variety of bars, clubs, and watering holes in Aruba and welcomes guests from all over the world with a minimum age 18. A variety of tours are offered, including the Kukoo Kunuku Dinner & Nightlife Tour, which features dinner under the stars at Casibari Grill and three bar stops, the Kukoo Kunuku Pub Krawl, the Kukoo Kunuku Rocks & Beach Tour, and Kukoo Kunuku Speciality Group Tours for special occasions. Private transfers in the party bus are also available, as are gift certificates. 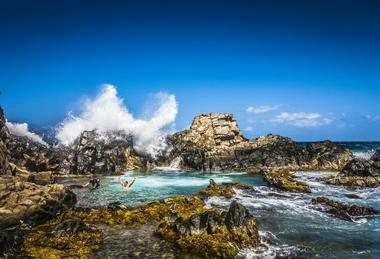 The Natural Pool Safari Tour is run by ABC Tours Aruba and offers a memorable getaway to the spectacular coastline of Aruba in state-of-the-art Land Rovers. This half-day, 4-hour Natural Pool Safari visits famous attractions and sites such as the Natural Bridge, Bushiribana Gold Mill Ruins, Aruba's Arikok National Park, and the Natural Pool or "Conchi," where guests can swim and snorkel in the crystal-clear waters. The Natural Pool is formed by a wall of a volcanic rock formation that provides calm waters for swimming and is home to a variety of colorful corals and fish. This tour is conducted in comfortable, air-conditioned Land Rovers and includes hotel collection and drop-offs, ice water, hot lunch, and snorkeling gear. 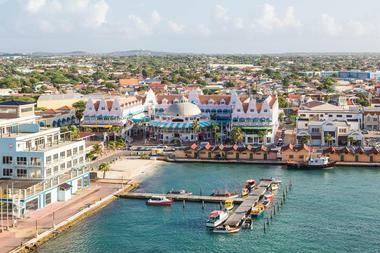 Seamlessly blending the old and new to create a distinctive charm, Oranjestad is a bustling harbor city and the capital of Aruba. Beautifully restored landmark buildings stand alongside international luxury retailers and high-end boutiques, and a variety of cafés, restaurants, casinos, bars, and nightclubs provide a buzzing nightlife for both locals and visitors to the town. A new state-of-the-art tram runs from the cruise terminal into town and all the way along the newly landscaped Main Street, moving the thousands of cruise-ship goers that visit Aruba every year. Tuesday evenings present the Bon Bini Festival in the outer courtyard of the Historical Museum, which showcases the island's history through local music and art, traditionally costumed folkloric dancers, and delicious culinary specialties. Action Tours Aruba's UTV and ATV tours offer a range of fun and exciting tours for singles, couples, and families that explore Aruba on horseback, ATVs, and UTVs. ATV tours visit some of Aruba's best sightseeing places, such as the Alto Vista Chapel, the Bushiribana Gold Mill ruins, the Natural Pool, and Baby Bridge and last approximately 3 hours. UTV Tours are 3-hour guided off-road tours to the famous California Light House, Black Stone Beach, Wish Rock Garden, the Bushiribana Ruins, and Baby Bridge. Horseback tours offer a 3-hour experience on horseback from the picturesque Rancho Daimari that visits hidden gems such as Moro Beach, Daimari Beach, and the Natural Pool. 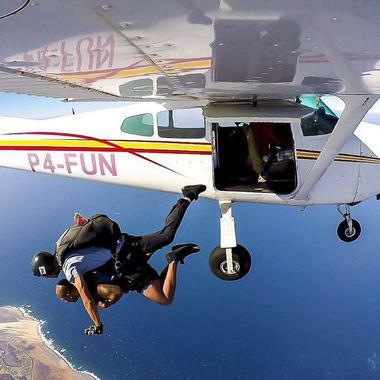 Skydive Aruba offers safe and professional skydiving adventures over the beautiful waters and beaches of Aruba. Owned and operated by Rick and Lisa Hornsby, Skydive Aruba has been taking guests into the sky for over 18 years and is also renowned as one of the longest standing and safest skydiving businesses in Florida. Skydiving trips are made in a Cessna 182 plane, which has been specifically designed for skydiving and is maintained to the highest standards of safety. All equipment is provided, and jumpers must be in a relatively good physical condition with a minimum weight of 100lbs and a maximum of 220lbs. Aqua Windies is a unique dive training and aquatic fitness facility in Aruba that features several swimming pools of different sizes and offers a range of scuba diving and swimming instruction as well as other water activities. Aqua Windies offers professional PADI dive instruction for all levels as well as children's diving classes, swimming lessons, toddler swimming classes, water fitness, hydro riding, and snorkeling. Aqua Windies also offers adventure camps during school vacations for island children and vacationers alike and includes water-based activities such as body boarding, snorkeling, swimming, and more. Aqua Windies is also home to one of the biggest dive shops in the Caribbean and sells a variety of diving and snorkeling equipment. 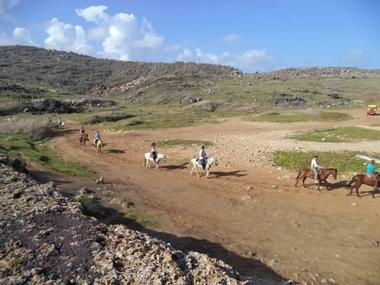 The Gold Mine Ranch offers horseback riding adventures and expeditions to Aruba's most beautiful beaches, valleys, and lagoons. Horseback adventures include visiting beaches on the northeast coast of the island as well as the Hidden Lagoon and the Hidden Valley and many other off-the-beaten-track gems. Expeditions are led by experienced guides and the horses provided are suitable for people with little or no experience with horseback riding, as well as for more experienced riders/groups with varying abilities. Friendly, welcoming staff provide excellent service throughout the adventure and transportation to and from the ranch is available upon request. 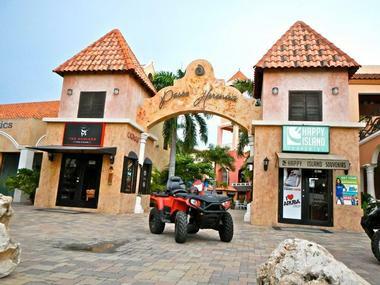 Experience Aruba on three wheels with a Trikes Aruba tour. Trikes Aruba offers tailor-made 3-hour tours of the island on safe and comfortable trike bikes, three-wheeled motorcycle-like vehicles with two wheels in the back and manual or automatic transmissions. The tours visit some of the most popular attractions, such as the Alto Vista Chapel, Eagle Beach, the California Lighthouse, and Bushiribana Gold Mill as well as Mangel Halto, the Casibari Rock Formation, Frenchman's Pass, and the local fish market. 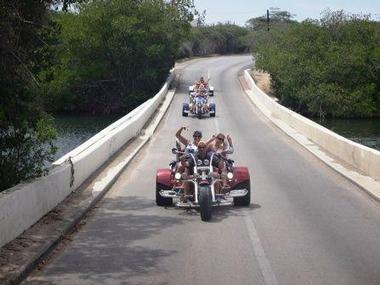 Guests drive their own trike bikes on these guided tours and all safety equipment is provided.